It’s that time of the year again when zillions across the globe – and indeed India – await breathlessly the most hi-profile, glamorous, star-studded showbiz event on Planet earth: The Oscars! Before we go to the main course which focuses on why India, forever seems to be a participant and not a competitor, it might be interesting to examine the importance of the Best foreign language film. Be honest. Has it ever aroused the remotest curiosity, generated the faintest buzz, sparked any real interest or unleashed the hi-octave adrenalin that the major awards do? In fact, to the perceptive, don’t these awards remind one of our Regional award-winners at the annual National Awards event, attracting polite and indulgent applause, lip service and media space for a couple of days before abandoning them to oblivion? What happens once the mingling with the biggies and the partying and photo-ops are over? Once the quaint foreign-accents are complemented and the fake bear-hugs and air-kissing end? Classy, international star Victor Banerjee of the 'A Passage to India' and 'Ghare Baire' fame offers his take. “For me, much more authentic and insightful than the populist, dazzling, star-heavy mainstream marque products are the foreign language films. Why? Because they are chosen totally on artistic merit and not hysterical lobbying powered by obscene marketing budgets. C’mon, what can films from Chile, Hungary, Sweden and Lebanon do in terms of spending power?" Right. Since the basic importance of the Best Foreign Film category is out of the way, let’s zero-in on the central subject: Why India continues to be treated as an untouchable in the Oscars event? Why, over the last 50 plus years that we have religiously sent our stuff – with lots of excitement on our end – it’s religiously been dumped in the tray marked OUT? Why, except for Mother India, Salaam Bombay and Lagaan, it’s been the Wrong Number all the way? Hi-profile lyricist and activist Javed Akhtar refuses to beat around the bush or play footsy and cuts to chase in a flash. “Our films lack the quality that the winning entries offer. Just not good enough to match global standards, even if we believe otherwise. Obviously low in the required local roots, global perspective template that embraces a universal vision”. Celebrated film-maker Aparna Sen of '36 Chowringhee Lane', 'Mr. & Mrs. Iyer' and The Japanese Wife, however, doesn’t understand the hype and fuss that accompanies this yearly circus. “What’s this annual tamasha anyway? Why such a song and dance and mesmerised captive audience glued to the box, early morning, to catch the show LIVE? It’s a Hollywood-specific event for heaven’s sake, where excellence is not always the criteria for the winning entries. Other issues are at play. So, while our much-acclaimed Newton was sent with hi-praise and hopes, it was once again a case of NEXT! And onto the next year, hoping woh subah kabhi to ayegi. 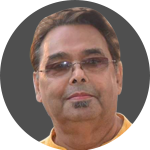 Monojit Lahiri is a media commentator, specialising in cinema, advertising and popular culture.